The word "honey" comes from the Germanic root hunaga, meaning "golden". The earliest record of keeping bees in hives (as opposed to "hunting" from nests) was found in a temple erected to the sun god Ra by Egyptian king Neuserre circa 2400 BC at Sakhara, near Cairo. 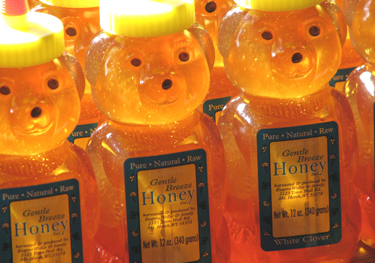 The U.S. per capita consumption of honey is about 1.3 pounds. Honey is composed primarily of carbohydrates and water, and also contains small amounts of a wide array of vitamins and minerals, including niacin, riboflavin, calcium, copper, iron, magnesium, manganese, phosphorus, potassium, and zinc. One tablespoon of honey contains about 65 calories. It is well-known that carbohydrate ingestion prior to, during, and after exercise enhances athletic performance and speeds recovery. Honey is a natural source of readily available carbohydrates, providing about 17 grams per tablespoon. Honey should not be fed to children under one year old. Honey may contain Clostridium botulinum spores that can cause infant botulism – a rare but serious disease that affects the nervous system of young babies (under one year of age). C. botulinum spores are present throughout the environment and may be found in dust, soil, and improperly canned foods. Adults and children over one year of age are routinely exposed to, but not normally affected by, C. botulinum spores. 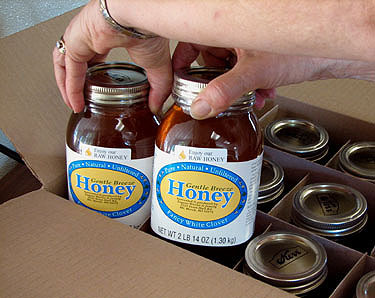 Always store honey in a sealed container at room temperature, never in the refrigerator. If stored properly, honey will never spoil. If honey crystallizes, simply place the honey container in moderately hot (not boiling) water and stir until the crystals dissolve. Apiary: Location where honeybee colonies are kept. Extracted Honey: Honey that has been separated from the comb by centrifugal force, gravity, straining, or other means. Filtered Honey: Honey that has been processed by filtration to remove all or most air bubbles, pollen grains, and other particles in suspension. Raw Honey: A term used to describe unprocessed honey that has not been overheated or filtered. Another term is natural honey. Spun Honey: Honey that has been allowed to naturally granulate under controlled conditions to make a smooth, spreadable, textured honey. Strained Honey: Honey that has been passed through a mesh material to remove most of the particles (including comb) normally found in unprocessed honey. Straining does not remove pollen.